Just now starting to put together some wood working equipment. Lots of experience in machinery and tools just not a lot in wood, i.e. planers, bandsaws, lathes, jointers, etc. My plan is to be able to saw say a 3 foot x 10-12 inch log into usable boards. I’d like to be able to sometimes use my own trees, cherry, oak, maple and make stuff like bowls, spindles, shelves. I think a 2HP should be able to do that. I am getting real close to buying a bandsaw. I like the Grizzly G0513X2BF as it seems to have enough features to make it a good usable user friendly machine and without breaking my bank account. I did look at the Laguna brand but they seem to fall short of the Grizzly. For what its worth Grizzly seems to have a good rep for customer service?? Would anyone be so kind to help me out. I have had the older version of that saw for about 7 years now and I’m quite satisfied with it. It has plenty of power and a good fence. One quirk is the 131 1/2” blade which is not a common size so I either order the blade from Grizzly or have it custom made….fortunately a local saw shop does that with no problem or extra expense. I see they have added a foot brake that my older one does not have. One feature I wish mine had was easy removal of the top so blade changes and guide adjustments would be easier. When sawing odd shaped wood on a band saw make sure you have good control of the wood so the saw blade does not torque, roll or otherwise deflect the movement while you are sawing. You can not only be injured but it will certainly damage the blade. Be careful. 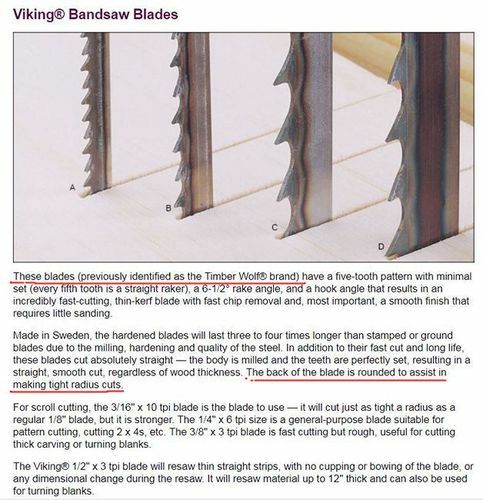 Be aware that bandsaws were originally designed to cut meat. Never thought about blade length. Will check around my area (north of Harrisburg pa) to find a custom blade maker. Or just make my own. Most machine shops have a bandsaw with a welder right on it and can make a blade of any length weather its for wood or metal. when you say “3 feet by 10-12 inches”, do you mean 3 feet long by 10-12 inches in diameter? The max cutting height on that saw is 12”, so if it’s the other way around it wouldn’t work. If you’re looking for an affordable way to resaw whole logs, I think the cheapest way is to get a chainsaw mill..
Now off to find some good blades. And as I gather the resaw blades need to be first class. When working with green lumber check into the Timberwolf brand. They have been very good to me and for me. Their website explains a lot but they also have good customer service in my experience. Beware blades to Resaw wet wood are different then blade we use to Resaw dry woods. They should have more set to clear away the wet fibers. That’s a small bandsaw for resawing so your choices are limited. I have the cheapest version of that saw and I have used it exactly as you said you plan to. Very happy. Timberwolf sells the right length blades and I am happy with their performance. Look for their 3/4” blade for cutting wet wood. I think that the best price at the time (3 years ago) that I found was actually on Amazon so don’t forget to check there. Note that for sawing logs, I found that it is helpful to make a sled that will hold the logs so that you can get nice straight boards. You’ll find a few examples and designs in the LJ projects section. It takes about an inch off the maximum diameter but makes the process go a whole lot better. 3’ is about the longest I can handle by myself. About half way through, I walk around and pull the log through the rest of the way. This might help on Blade Choices. It’s from Lee Valley, the Prices and sizes are on there. The prices range from about $16.00 to $22.50. Note that one of the best things I ever did on my Band-saw was to Round Off the Back Edge for a few reasons. They mention that these ones are Pre -Rounded. Hope this is of some help Jim. I have a local tooling company that does 103” blades 3/16 aggressive blades for 12$. I order 12 at a time though. My saw is 2 hp 110. I wouldn’t even think about a 10” log with a saw like mine. I would go for a 5HP for something like that. I think grizzly has sompthing in the 2 grand range. Never gave the wet vs dry wood a thought thanks AJ also didn’t realize that the 2hp was going to be a liability for resaw work :(. Oh well too late to cry because the features on the 513 vs a 514 overrode my decision. Also because I won’t be using the saw a lot so the motor brake was a safety feature I felt was worth the money. Even though this saw is mainly to make wood for my wife’s projects she might be a tad miffed at me spending an extra $500. I’ve never felt like the 2 HP wasn’t strong enough when milling logs, at least when the blade was new and sharp. The first log milled on my Griz 513 was a 10” hickory from a dead tree and the 3/4” Timberwolf cut it easily enough even though it wasn’t the one specifically for wet wood (I didn’t know better at the time). 3 years later, I can definitely tell the blade needs to be sharpened but that’s not a problem with the motor. Even with a duller blade the motor speed doesn’t vary, even though the speed of the cut does take a little longer. If I used it to resaw more often, a bigger motor might be nice but for my needs, it is fine. If you haven’t watched the Snodgrass Bandsaw Clinic YouTube video, I highly recommend looking at how he recommends setting up the blade tracking. It is different than the Griz manual and definitely makes it cut better IMO. One other note, when cutting wet wood, the blade gets dirty pretty fast which seems to have more impact on cut quality and speed on green logs than anything else in my experience. A bath in Simple Green will loosen the build up quickly. I use one of the largest cheap plastic plant trays you can get at HD or Lowe’s to soak the coiled blade for cleaning.